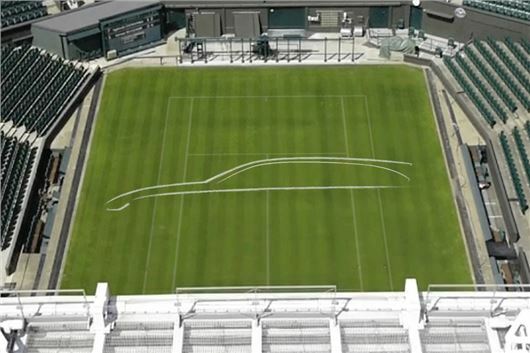 Jaguar has released the first teaser images of the XF Sportbrake – by drawing a picture on Wimbledon Centre Court. The new XF Sportbrake is due to go on sale in Summer and will share engines with the saloon – so there’ll be petrol and diesel options, both in 2.0-litre four-cylinder or 3.0-litre V6 arrangements. Prices will probably start at around £35,000. The sketch reveals a predictably tall, estate car roof with a coupe-style window line, much like the design of the previous car. There are no details about specification, dimensions or anything else just yet, but we’d be surprised if head room and luggage space weren’t improved a touch over the outgoing car, which had a 550 litre load capacity. Along with the Wimbledon sketch, Jaguar has released an overhead shot of the car (below) which, again, reveals very little. It does show off a full-length sunroof – although this isn’t likely to be standard fit. Since Jaguar is a partner at Wimbledon this year, we’re expecting to see more of the car when qualifying kicks off in late June.